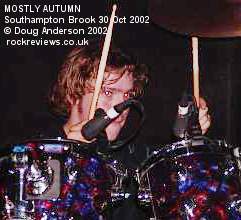 If you don't know who Mostly Autumn are I suggest you read the index page or consult my review from earlier in the year. Here is a list of who plays what. 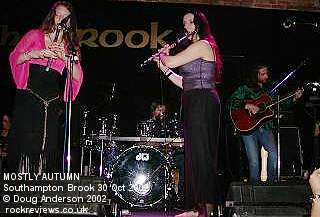 Recently back from a pair of debut American shows in New York City and Trenton, New Jersey Mostly Autumn are around half way through a six week stint around the UK by the time they reach Southampton. This time they are returning to some favourite venues (tonight for instance is their third visit to the Brook) as well as expanding into to new and untried towns and venues for their most epic tour yet. Things haven't been all fun though as in Liverpool a falling fire curtain hit band founder and guitarist/vocalist Bryan Josh firmly on the head causing him to miss the following evenings performance in Worcester. The band had to swap things around but managed to pull together a different and folkier set for that one evening. Bryan was back, still a bit groggy perhaps, for the following evening. Tying in with the tour (and much discussed on the MA Message board) is a not quite as new as you may imagine 2CD compilation Catch The Spirit. Half the re-recorded tracks feature on a similar styled CD from earlier in the year, Heroes Never Die. Also on sale were copies of the MA fanzine Autumn Leaves and a reasonably priced tour programme at just £4. Many of the photos feature in the new compilation booklet but they are far larger and better quality in the programme. Unlike last time at the Brook there is no support tonight (John Young provided a popular set on May) though Damian Wilson would have filled that spot had there not been an 11 pm curfew at the Brook. Shame as it would have been nice to see him again after his stunning performance at the Whitchurch Festival in August. Tonight we are back to the normal tour set (folky numbers reappeared for that one different line-up show) so the show remains similar, but not identical, to Glasgow a week or so earlier. Marginally after 9pm the five gents emerged from the black door in the black wall that characterises the smallish Brook stage and began with drums adding to the initial keyboard whooshes before a guitar riff kicked into an unfamiliar tune. Under cover of this the womenfolk emerged and kept to the shadows until the riff migrated towards the more familiar introduction to the stomping NOWHERE TO HIDE (CLOSE MY EYES) whereupon the ladies moved forward. Heather Findlay joined Bryan with harmonies and echoed choruses while keeping the beat with her tambourine. Wasting little time Bryan bid us a brief "good evening" before switching straight into DARK BEFORE THE DAWN, the audience clapping in expectation as the guitar led the bass and pounding bass drum. Heather was obviously impressed by the size of the crowd and commented "You've obviously all been talking to your friends about us since last time, this is fantastic. I'm glad you were convinced." Turning back to the task at hand she then explained that the following track was from The Spirit of Autumn Past album, "a tune that Bryan and I put together and is quite heartfelt. Its about looking at nature and seeing the parallels that we can identify and match with our own lives." This is." A recognitionary cheer and round of applause greeted EVERGREEN when it was finally named before Bryan gently introduced the piece. It remained slow and quiet for the first verse before changing like the seasons and becoming far more boisterous. Bryan explained the next song was "about a one way ticket, about doing something you're not going to finish. This is called THE LAST CLIMB." 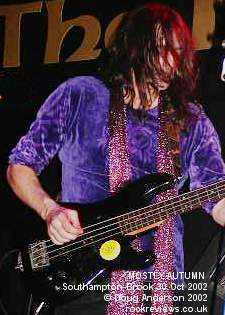 One of the influences claimed by the band is Deep Purple and though I don't see many influences in the music the introductory guitar section does imitate the cello effect Ritchie Blackmore possibly invented by rotating the volume knob on his Stratocaster with the little finger while playing. This is the first of a few times the effect is used tonight. A far more obvious influence though is Pink Floyd once the vocals begin. 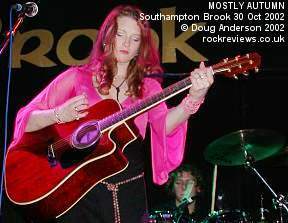 Heather donned an acoustic guitar for this and stood with her back to Bryan, facing the drumkit, as Bryan played the intro with Ian Jennings adding ripples of keyboard colour. Angie Goldthorpe added flute to sections of the tune though the vast expanse of echoed guitar filled out most of the piece. Some confusion followed as Heather realised the "next tune is something I need my low whistle for which McKinty's just gone off for." Deathly quiet followed until the Scotsman returned with the instrument in question which Heather found to be "freezing" as it had been outside in the equipment van. One of the folkiest pieces, OUT OF THE INN, followed with the ladies on whistle and flute for this jaunty meandering piece. 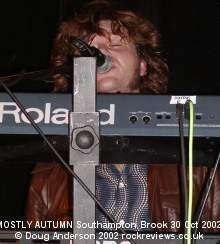 Second guitarist, and a man hidden at the rear of the keyboards, Liam Davison added rapid acoustic support with Ian eventually joining in on keyboards. Finally, to complete the sound, Bryan kicked in with electric guitar while Andy Smith's bass and Jonathan Blackmore's drums joined as the pace increased to a screeching end section for which the ladies departed the stage. Loud cheers followed the sudden end to the rock explosion and things were brought right back to slow and moody when the keyboards introduced a track that could share a lyrical theme with Ian Gillan's Concerto trepidatious feelings, PLEASE. 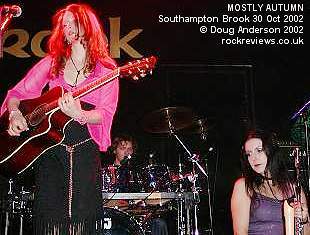 Heather alone returned to echo Bryans vocals, her tambourine being brought in as the tempo increased for the second verse. Bryan then explained the band were "going to do a song then take a short break." The crowd groaned but knowing a second set was to follow accepted the offer of a pee and glass refreshing break as another soft guitar interlude, HALF THE MOUNTAIN, presented a soft ending to the set that helped bring the crowd down for the ten minute or so interlude. Bladders relieved and glasses replenished the boys in the band returned at a couple of minutes to ten, Bryan in particular checking the tuning of his restrung guitar (broken towards the end of the first set). A minute later a jangly keyboard pattern underpinned Bryan's breathless opening vocals, again very Dave Gilmour era Pink Floyd, for THE NIGHT SKY. Initially Bryan was alone on vocals but a few lines in Heather stepped out from the shadows and up to the microphone to join in as the others sat and listened. Soft drum patterns then joined the vista before Bryan switched to guitar and Angie stepped up with a long metal whistle. 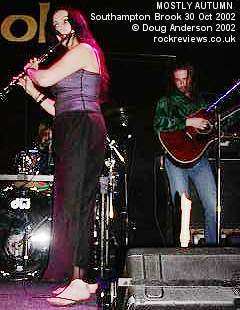 Shared vocals continued into the second verse as Angie swapped to flute and waited for the musical break. Her time on the whistle didn't last long though and the piece extended with a sort of 'lost in the wind' guitar solo soaring around the floors of the venue with just a hint of gently strummed acoustic backing from Liam. Angie left stage for the long guitar end section and returned armed with those two wooden recorders as the bass heavy intro to WINTER MOUNTAIN thundered from the backline. Angie featured again on backing vocals too for most of the choruses. 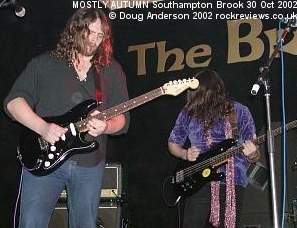 In the last four tracks the band had taken the audience down from hard rock to gentle folk and then worked them back up again after the break to what could be considered a little homage to Ritchie Blackmore's Rainbow days judging by the end section echoing the similar repeated vocal calls of "I'm coming home" on A Light In the Black. The crowd certainly appreciated it and maybe the extra alcohol time lowered their inhibitions as the round of applause that erupted was the loudest yet and a a portend off things to come. Heather commented on the " wonderful keyboard solo by Iain Jennings" during Winter Mountain with Bryan adding "you just can't stop him, can you?" Heather echoed the sentiment before moving on to introduce probably her most personal song of the evening a "hearty song that means a lot, particularly to myself" and one that "helped me during ... a noisy time in my life, no, I didn't mean noisy, a difficult time in my life." She then paused, as if deciding to say more, before simply introducing SHRINKING VIOLET. The introspective song was backed by a light, repeated, string of notes with almost imperceptible keyboards backing the first verse which picked up a little for the chorus. Linking into the next verse was added some whistle before everybody's instruments joined in as Angie switched to back Heathers lead vocals to the songs conclusion. Liam disappeared for NEVER THE RAINBOW, a barnstormer that kept the beat rapid and power level high. Angie took Liam's position and sang backing vocals to Heather's lead from his mic. Iain was more to the fore on this number with a some less restrained playing before Bryan finished off with some wild riffing. Andy and Heather stood back to back during this segment, rotating slowly tonight! The crowd obviously loved it as they were as wild in their enthusiastic appreciation as Bryan and Iain had been in the performance. Heather had something to share with us, her appreciation of Angie's vocals which were "absolutely incredible. I said (to Angie) can you sound like Bruce Dickinson but she sounded more like Kate Bush, which is fantastic. That was amazing." The crowd agreed with a round of applause before Bryan explained "this may have to be the last song this evening" before thanking us for coming and adding that the band enjoyed coming to Southampton tonight being "the third time we've played here actually and its kind of grown as an audience. There's a really good atmosphere and we really do enjoy it." A cry from behind me demanded "come back more often" to laughs from crowd and band alike. Bryan continued and explained the background to the song that he wrote "after losing my father and it kind of wrote itself really. This one is always for him and anybody who's ever lost anyone." 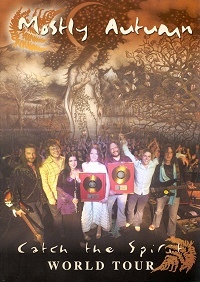 HEROES NEVER DIE was introduced with some quiet picking to which was soon added a keyboard and flute backing on the long lead up to the joint vocals of Bryan and Heather for the verse and chorus. After the ever ascending epic (and another broken string) the band left the stage to rapturous applause and Heather mentioned "I know we'll be seeing you again!." as Ian clambered under his keys to join the queue through the little black door. As they returned a minute later Heather complimented the crowd by referencing them to a longer term fanbase, " You lot are becoming like Hartlepoolers." A wag in the audience piped up "That's up North" showing his grasp of British geography though it has to be said that almost anywhere in the country is North of Southampton almost by definition. Ignoring the call Heather added "I think I can speak for the whole band here, we've just had a wonderful evening" as the crowd cheered for themselves in appreciation. Taking the edge off the compliment she also quipped "having said that we're all pissed as newts" (which may explain Bryan's broken strings) An odd request then came from the crowd "can you do Top of the Pops next week?" A confused Heather decided to move quickly on before the crowd took over completely and prompted Bryan to "be serious while I shut up." Bryan may have decided banter would provoke further confusion so simply explained that the final song was "about drawing parallels with your relationship with your mother and mother nature and how we tend to take things for granted." MOTHER NATURE began with dual acoustic guitars until the addition of keyboards into the mix brought things up a little before Heather joined Bryan to echo his vocals. Iain's single keyboard had been turned round now so Angie has her sole chance to play it tonight, stepping forward from the shadows for the brief chance between the first and second verse. 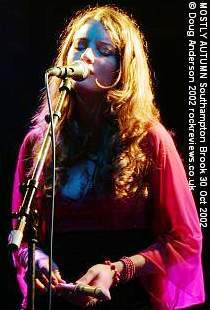 After second she turned to add backing vocals to the chorus as lights shone yellow on the front three bandmembers. A final bout of volume wheel rotating moved things towards the climax which broke another string as and required a quick swap to the red Strat. Before taking their bows Heather was blown away with "more hands than I've ever seen" before informing that the band would be out to "see you all soon so don't all rush off." She concluded by thanking the road crew and mercahndiser/manager who "all make it possible as much as we do." A huge ovation and 3 bows later band finally left through the black door to continuing cheers and a far better reaction than last time. I think setwise and maybe musically the last visit was slightly superior but the audience were much more behind the band tonight. Overall a pretty impressive show. After the show I bought issue 5 of the MA fanzine Autumn Leaves (£2.50) and the programme (£4) as having found my bank account was well into the red when I went to draw cash for the evening that was all I could afford. Unlike many tour programmes this one is reasonably good value for money, not quite as heavyweight as many but full of decent pictures and some short pieces of text by each member for their individual page. They use the Mean Fiddler shot as used in press adverts and the re-released DVD on the cover though instead of false balconies the shot fades up into the cover of the new compilation CD. This page is Copyright © Doug Anderson 2000 - 2002. Created: 31 October, 2002. Last updated: 3 November, 2002.